The all seasons duvet is made up of a combination of 2 individual duvets which are clipped together using premium YKK snap fasteners. This duvet construction provides all year round flexibility which can be adapted to the weather conditions and personal requirements of the user. The duvet is made up of a 9.5 Tog and a 4.5 Tog duvet which when combined provide 13.5 tog for the colder winter nights. The 9 Tog option can be used on its own for spring and autumn where temperatures are a little warmer and the 4.5 tog is generally used for those warmer summer nights where a lighter duvet is required. All Seasons Duvet – The best duvet for all year round. Since duvets were first used in Scandinavian countries by the Vikings the search for the best duvet for all year-round use has eluded sleepers. While a duvet with a low tog rating is ideal for warmer, summer months it is not warm enough for the colder winter months and vice versa for a thicker 13.5 tog duvet. This dilemma has led to the creation of an All Seasons Duvet which consists of two duvets of a different tog rating which can be clipped together to create a very warm winter duvet. This page covers the details of these duvets and their benefits. What is an all seasons duvet and how does it work? All seasons duvets are also sometimes known as four seasons duvets, combination duvets or clip together duvets but are all virtually the same. The main difference is usually the filling. An all seasons duvet comprises of two individual duvets which can be clipped together to form an extra warm duvet. All our all seasons duvets are made from high quality 100% cotton cases that are Nomite® and Downafresh® certified and the clips are premium YKK press stud style fasteners. The standard tog ratings are a lighter 4.5 tog duvet, ideal for summer and a 9 tog duvet which, on its own, is a perfect intermediate weight ideal for Autumn and Spring time. 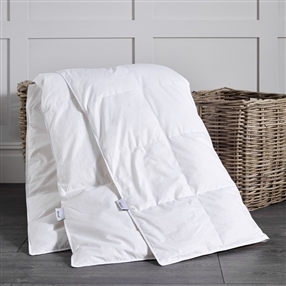 When these two duvets are clipped together they form a super warm 13.5 tog duvet which is an ideal rating for the colder winter months. How should I store my duvet when not in use? All seasons duvets offer a 3 in 1 duvet option so if it is warm and you are using the 4.5 tog duvet only you will need to store the 9 tog duvet properly while not in use. We recommend that you keep and re-use the box that your duvet is delivered in as this not only contributes towards saving the environment but also allows the duvet to breathe and keep it dust free. This is especially important for natural feather and down fillings. The rigid box will also prevent the duvet from being crushed and losing shape and our box will fit under most bed frames. We don’t recommend storing natural feather and down filled duvets in plastic bags, especially the vacuum bags as these can crush the fillings, cause them to sweat and create orders due to the lack of air flow.